Not every cell culture experiment is carried out in monitored bioreactors. Learn how continuous monitoring of different cell parameters can also be performed in conventional laboratory vessels such as shake flasks. 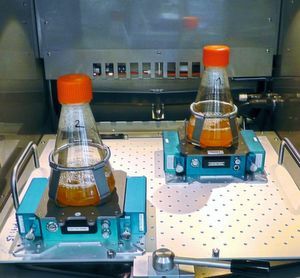 Cultivation of yeasts in shake flasks is quite common, but typically the commercially available flasks are not instrumented and therefore allow no online measurement of key process parameters such as CO2, O2 and pH, which have a strong influence on the cultivation outcome. As a result, monitoring of cell growth does not take place at all, or is performed in an invasive way, i.e. taking out samples for determination of the optical density or CO2. This proceeding inevitably leads to disturbances in the media and increases the risk of contamination. Moreover, in these cases the monitoring of multiple parameters at all time points is not possible. Nevertheless, these drawbacks can be overcome completely with the non-invasive measurements performed by the SFR vario device because there is no need to sample the flasks to monitor the parameters. The SFR vario device was already able to measure pH, biomass and DO simultaneously. In this application note, the reliability of dissolved CO2 values measured online with a new optical sensor was investigated. The innovative and autoclavable CO2 sensor proved its utility in the monitoring of the complete growth profile of yeast Saccharomyces cerevisiae in YPD medium. DO and biomass were measured simultaneously with the SFR vario device. Finally, offline measurements of CO2 and OD 600 were carried out for comparison and validation. Commercial baker’s yeast (S. cerevisiae) was cultured in YPD medium at 300 rpm and 30 °C. For cultivation 500 ml baffled and non-baffled Erlenmeyer flasks were used with 200 ml working volume. In each flask an optical DO (SP-PSt3) and CO2 sensor (SP-CD1T) was integrated. The sensors were read out with the SFR vario, which was also used for online biomass monitoring in the cultures. Data recording and measurement control was realized with the Presens Flask Studio software. During industrial use of yeast such as Saccharomyces cerevisiae the metabolism has to be controlled tightly in terms of oxygenation and carbon source supply, in order to prevent the production of unwanted metabolic products and to force the desired compounds. A continuous monitoring of these parameters is correspondingly important to receive the desired results. The SFR vario can read out two optical sensors integrated in an Erlenmeyer flask — one oxygen sensor and one pH or CO2 sensor. The optical measurements are performed through the transparent bottom of the flask. The reader also has dedicated optics for biomass measurements. Therefore, light emitted by a LED is transmitted through the flask bottom and is then scattered by particles or cells in the medium. This scattered light is then detected by a photodiode and can be translated into a signal amplitude by the reader. By a non-linear calibration model these amplitude values can be correlated with e.g. optical density or cell dry weight. All parameters are measured simultaneously, so detailed information about culture development can be followed online.